Our patent pending “pole top” mounting system is unique and looks like a standard table sign mount because the display sits on top of the pole, not in front of it. 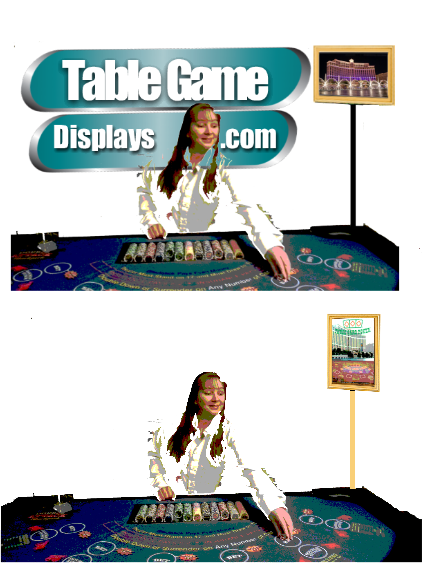 Our 15.6” displays are the perfect size for table games and are no larger than a traditional static sign. These are commercial grade HD IPS displays, which means they can run long hours and have a viewing angle of 178 degrees, so all of your players will be able to easily and clearly see your messages. We also have 17.3”, 14.1” 13.3”and 10.1”. Other sizes are available. 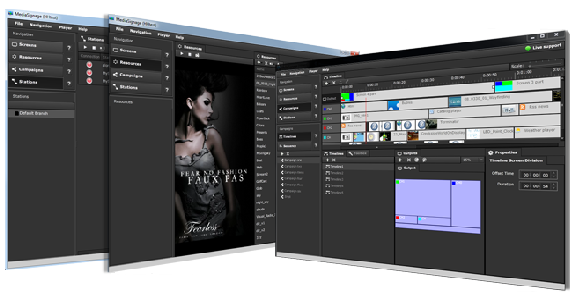 Our Professional digital signage software is the most powerful and versatile in the industry. It includes extensive video tutorials on every aspect of your digital signage so you can easily train members of your own staff to control your signage. Your files are all stored in the cloud and each sign stores the current file in the their cache. So even if your Internet goes down your signage continues playing. All of the signs are controlled from a computer at a remote location of your choosing. 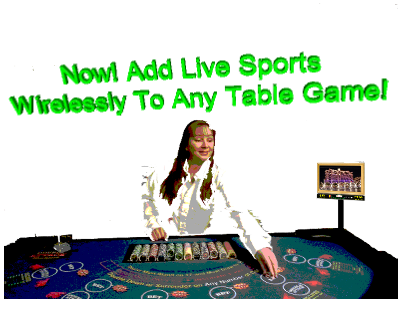 Our digital signage is CUSTOM designed for casino table games and have a sleek “tablet style” frame that compliments any casino table game! Three sizes to choose from. The 15.6” is our standard size model with a single wide screen.The 17.3” size looks great in portrait style (vertical) with 2 screens (split screens). With our new “Double Signs” you can show sports on one and digital signage content on the other. You can also choose a small 10.1” wide screen display on a short pole mount. See our products page for details on the various models, The software that powers the signage is some of the most powerful and versatile in the industry. To keep your signage always interesting, you can add RSS feeds of sports, news, weather, entertainment and even social media. You can easily update your info anytime to keep players informed of events, tournaments, dining specials,etc You can even keep players Informed of their place in line at restaurants so instead of waiting in line they are playing at the tables. 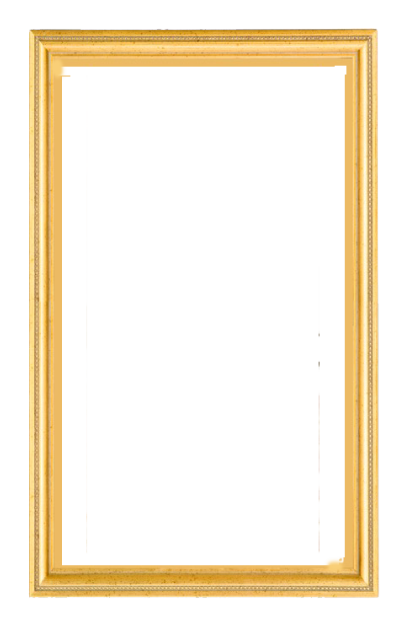 Add a twitter feed to instantly add messages from any authorized personnel. Select any YouTube videos to keep your content fresh and your guests entertained. These are just a few of nearly 50 smart components you can add for free! See our Smart Components Page for a full list. Best of all you can now turn PREVIOUSLY WASTED SPACE into a revenue generating ad and information machine. Our digital signage will literally pay for themselves in a matter of months. Either through ad revenue from casino concessions or through increased business in casino owned amenities. For every dollar you charge per minute of ads per display. You will make up to $480 per day in revenue (based on 20 minutes of ads per hour). You can also add our custom made “game name” signs. 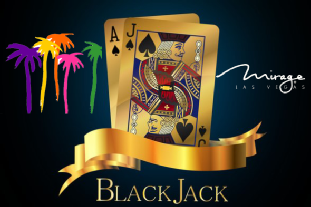 You can either use our graphics or submit your own unique design with your casino logo. Our signs are made of high quality aluminum and mount on the back of the displays mounting plate.